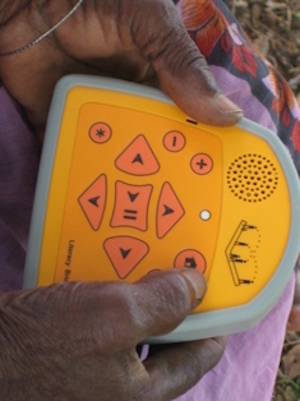 Talking Book is a low-cost audio computer designed for the learning needs of illiterate populations living in the poorest areas in the world. Agricultural extension agents record information about farming techniques, such as fertilizer preparation, seed spacing, and livestock care. Nurses in busy rural clinics record health messages to teach patients about hygiene, infant care, and disease prevention. Microfinance organizations record economic empowerment information to enable remote villages to learn about credit, rotating savings plan, and business guidance. Once loaded with information, Talking Books are distributed to remote areas–acting as libraries for people who cannot read. In this way, residents can access the information repeatedly and when they need to apply it. When they are ill, pregnant, or cultivating land for a particular crop, information is readily available. Additionally, the Talking Book enables teachers to reach more students in over-crowded classrooms. Teachers record readings of instructional materials like textbooks, stories, the alphabet onto a Talking Book. They also create interactive audio lessons such as multiple choice quizzes, audio hyperlinks, interactive games suited to the needs of their students. Talking Books are then rotated between classrooms to help students practice literacy skills in environments where teachers are in charge of a large number of students.